MedX Health, a company headquarted in Mississauga, Ontario, has announced FDA approval of their Oralase diode laser. The device uses a GaAlAs diode to produce a laser light that cuts inflammation and consequently, pain after dental procedures. The 200mw device has a rechargeable battery and different tips. in Canada in 1999 and in the United States in 2002. 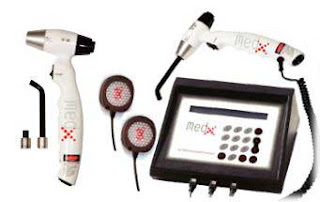 About MedX Health Corp. ----------------------- MedX is a leading North American developer and manufacturer of low level laser and light medical devices, including dental, rehabilitation and wound care products. MedX is the world's only company focusing on developing and delivering a broad cross-section of technologies and products involved in healing using light therapy. MedX is committed to advocating for and bringing the non-invasive, drug-free healing nature of light to people seeking relief from pain and other physical ailments. MedX plans to use the proceeds from its recent public offering to expand its distribution network; support its marketing program; continue development of new dental, rehabilitation and wound care products; undertake research and development for wound care products; and for working capital purposes. In particular, MedX plans to accelerate the development of a new product aimed at the rapidly-growing wound care market: its "Photobandage", a bandage technology that allows a wound to be bathed in light, designed to enhance the healing process. The Company intends to license this new technology to one or more major wound care companies for further development, marketing and sales. For more information, visit www.medxhealth.com.